LITTLE DARLINGS CHRISTENING is a unique fashionable brand of christening clothing that makes your baby look special and luxurious during one of the most important days in his life. The famous line has several big collections of amazing outfits and wonderful accessories. Each new collection represents extraordinary designs, styles and looks. 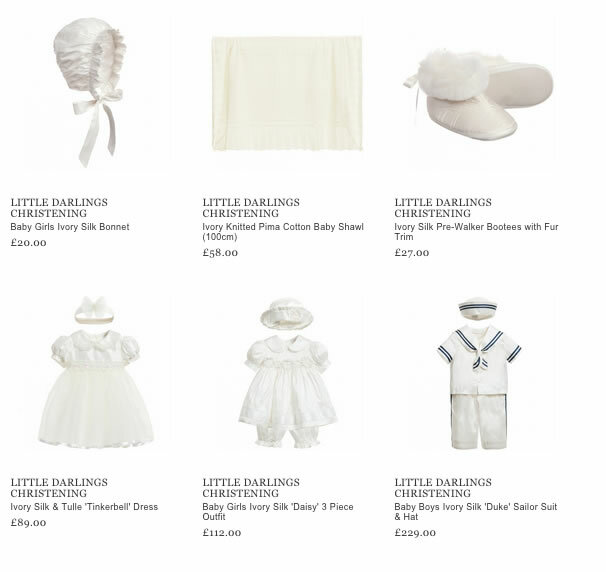 Each outfit is considered to be a masterpiece of LITTLE DARLINGS CHRISTENING. And it can be matched by additional items; among them are hooded ponchos or blazers, silk bonnets or pill box hats and others. It is worth noticing that besides the stunning designs, the creative manufacturers pay big attention to the quality of their products. Every item is made from the best fabrics, such as 100% soft cotton, silk, velour, velvet etc. Your kid will be provided with care and feel comfort for sure. In order to add some chic to the whole look, the designers use special elements in tailoring. Lace, frills, ruffles, fur details and sparkly sequins and others are believed to create a unique shape of a baby. Young ladies may enjoy a great variety of delicate hair accessories. They will add to girls a feminine look. Today the products of LITTLE DARLINGS CHRISTENING are already available for purchasing online.